“Shape of Water” One of the most beautiful, though improbable, love stories ever! Sally Hawkins is Magic! 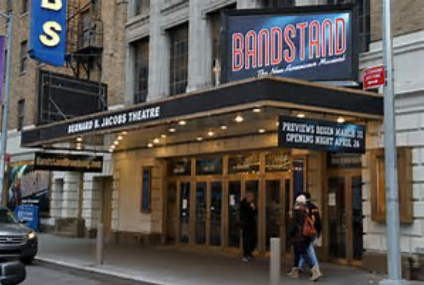 “Bandstand” Another Great New Musical Arrives on Bway! Broadway is just bursting with musicals as the season is quickly drawing to a close and the Drama Desk nominations have been announced (See post before this one.) 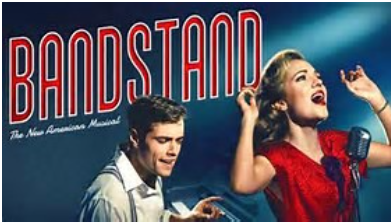 And a marvelous surprise was awaiting me when I saw “Bandstand” last night. It’s one of the best! And in the year of “Natasha, Pierre…and the Great Comet”,”Come From Away” and “Hello Dolly” that is really saying something. I had heard nothing about it. Didn’t know what I was in for. But trust me. It’s a Wow! I know I just said that about “Hello Dolly,” but this is a NEW musical. Brand new, with an entirely new score set at the end of World War II, as the boys come home to…Cleveland. I know that doesn’t sound like a great premise for a musical, but believe me, it was tremendous. Tremendously rewarding in its’ own sweet way. And it heralds the arrival of a sparkling new bunch of musical talent. Composer Richard Oberacker, who co-wrote the lyrics with Rod Taylor, has written a marvelously melodic, but also dramatic score with one terrific tune after the other.Written in what I guess you could call Swing time. The band is made up of overseas warriors coming home to find no jobs in Cleveland. (Think “Best Years of Our Lives”) and no work. 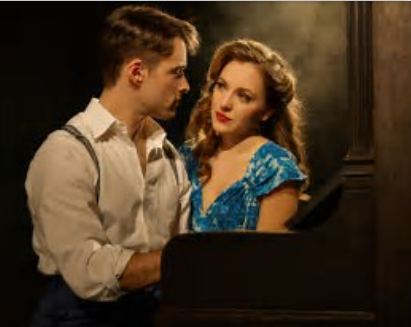 Laura Osnes is the only previously known quantity as the leading lady. Formerly “Cinderella” herself, and of course, “Hamilton”s great Tony-winning choreographer, Andy Blackenbuehler, who here makes his stunning directorial debut and well as keeping the dancing GIs and snappy home girls as peppy as a gin fizz. But the real find is their incredible young leading man, the charismatic Corey Cott, who opens the show and brings down the house in a wife-beater! Wailing a solo tune that bears his name “Donny Novitski.” The hairy-chested but wiry and very, very angry Cott howls up a storm about his plight and the war (and his Polish last name). 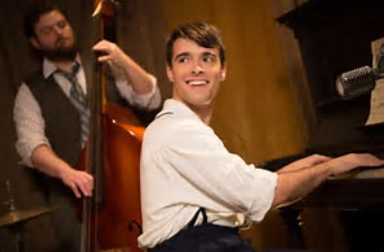 Corey Cott turns out to be the man of the hour from “Gigi”! He was the Louis Jourdan role in the delightful musical of the classic movie, which played all too briefly last season on Bway. Cott’s got it all, and is allowed to show his great musical as well as emotional range here, as he returns from the war, truly scarred and troubled, whose only solace is playing his music.He convincingly morphs into ambitious band-leader D0nny Nova, who falls madly in love, natch, with the adorable Ms. Osnes. She is a local girl and a Gold Star war widow, and Danny was her late husband’s best friend. Julia, who has the unfortunate last name of Trojan. 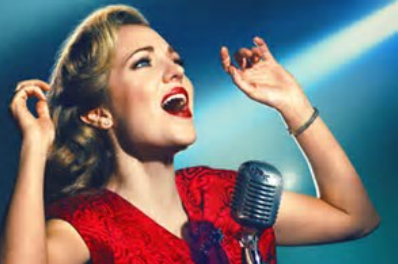 So she is Julia Trojan for most of “Bandstand”, and Osnes does her best work ever in this challenging, dramatic role, where she has to go from shy Sunday school church singer to swinging big band belter. And she does. And she’s been awarded a Drama Desk nomination for Best Actress in a Musical. This is in a year when her co-nominees are none other than Bette Midler, Patti LuPone,and Christine Ebersole. She and Cott sing their hearts out. And win ours in the process. I also have to say, I found “Bandstand”s book, funny and sharp, and amazingly well-written. And again it’s Oberacker and Taylor, who wrote it along with all the orginal music in the show. “Bandstand” is certainly a winner on all fronts. I couldn’t have enjoyed it more. And the fact that the main music is being played onstage by “Bandstand”s centraI characters, gives the 1940’s inflected music extra-snappy pizzazz, and oomph is another charming, jazzy plus. I hope audiences find it and embrace it the way Danny and Laura so romantically embrace each other in this tuneful war-time( and post-war) romance. It’s at the Bernard B. Jacobs Theater on W.45th Street, right in the heart of Bway. And I hope Bway audiences take it to their hearts, too. Oscars 2016 ~ Is Cate Blanchett Turning Into Meryl Streep? At first when I saw “Cinderella,” which I just loved, btw, I wondered whether the superb performances by the two leading ladies, Lily James(“Downton Abbey”s Rose) and Cate Blanchett as the not-so-Wicked-but-merely-troubled-and-lonely Stepmother, would even be considered for this year’s Oscar race. I now think that two-time Oscar Winner Blanchett for Best Supporting Actress is definitely a possibilty for a nomination. I think she’s becoming the New Meryl Streep, and will get nominated for her usually outstanding work in almost anything she does, even Disney fairy tale extravaganzas. So the precedent has been set. At least in the Supporting Actress category. 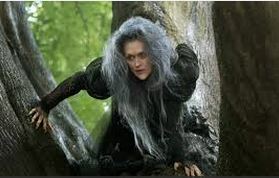 I mean, look, if Meryl Streep can get nominated for playing a Witch in “Into the Woods”, her astounding 19th nomination! 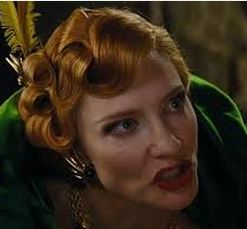 Then Blanchett certainly could for another fairy tale character. Sasha Stone of http://www.awardsdaily.com says her most-looked-forward-to film of 2016 is the upcoming Todd Haynes “Carol” which is the lesbian love drama based on Patricia Highsmith’s “The Price of Salt.” And yes, Blanchett is the lead in “Carol.” So theoretically, she could get TWO nominations this year. Bringing her net total so far to six, with two wins. And considering, as Sasha points out, this is another bleak year ahead for roles for actresses, Cate Blanchett very well pull off this double-nominated hat-trick. And on the male side, I personally think it’s Eddie Redmayne by a mile for Tom Hopper’s “The Danish Girl” opening now Nov.26, right in the heat and heart of the Oscar season. 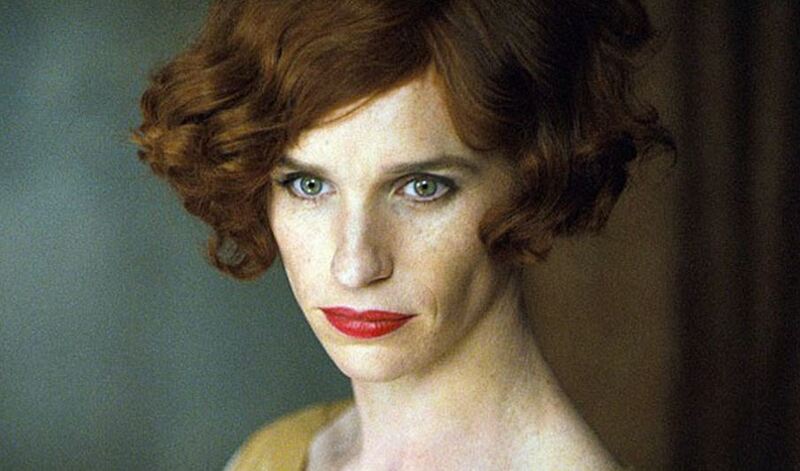 Could Eddie Redmayne do a Tom Hanks(as they say) and pull off two Best Actor wins in a row? He sure could. Could he beat out Leonardo DiCaprio in “The Revenant”? And get two Oscars while Leo wasn’t won one yet? Yup. Oscar Apple Cart Upset by Late-Breaking “Into The Woods? Stephen Sondheim and movies of his work have never really clicked with the public. See Elizabeth Taylor in “A Little Night Music”, and of course, more recently “Sweeney Todd” with Johnny Depp. But Musicals are catnip to the Academy. Depp is back again as the Big Bad Wolf whose nemesis is Little Red Riding Hood, a very lethal Little Red Riding Hood. But the word from the screenings yesterday is that Meryl Streep is once again going to be back at the Dolby Pavillion for something like her 20th nomination. But which category will she be in? Could she win? She’s got three Oscars already. The always excellent Emily Blunt has the Baker’s Wife role in the film and that’s the part that has historically won awards. Joanna Gleeson on Broadway won a Tony for Best Actress. And pert, pretty Anna Kendrick is getting good W.O.M. (word of mouth) as Cinderella. A former Oscar nominee for Best Supporting Actress for “Up In The Air” could she also be up again of her sparkling Cinderella? And where does that put Meryl’s Wicked Witch? The Academy put her in lead last year for “August:Osage County” when many thought she’d be Supporting and Julia Roberts would be lead, but the categories were reversed. That could happen to Emily Blunt, too. And she and Anna Kendrick could be up against the here-to-fore unstoppable Patricia Arquette in “Boyhood.” Would they knock her out of the leading contender spot? In Supporting. Meryl’s Witch certainly could. The plot sickens. Eddie Redmayne Now #1 on Gurus o’ Gold chart! I’m happy to say that Eddie Redmayne is now #1 on the Gurus o’ Gold pre-Thanksgiving chart! 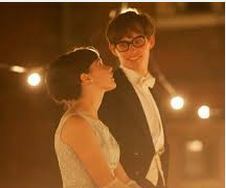 For Best Actor for “Theory of Everything”!Guess that’s my Thanksgiving Day present. They strangely didn’t do Best Supporting Actor, but now that I’ve seen and loved “Whiplash” J.K. Simmons has got that all locked up. Unless someone from the late opening movies “Into the Woods” and “Unbroken” knocks him out, but nobody in the Supporting Male Category for “Into the Woods” seems to be making an impression. NObody’s raving about Johnny Depp’s Big Bad Wolf. They ARE however raving about many femmes from that movie which just starting screening yesterday for press et alia. Meryl Streep’s Witch, Emily Blunt’s Baker’s Wife and Anna Kendrick’s Cinderella are all now in play seems to me. But NOT on the Gurus radar yet. Can’t wait to see it. There’s an embargo on writing about it, I understand, but since I haven’t seen it, doesn’t apply to me. At least not yet. I hopeit’s as good as I hope it to be. We’ll see.